I made this meal back in July or August when zucchini were plentiful, and I had a guest coming over. 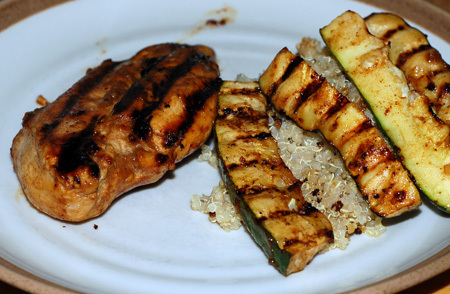 It was very flavorful and the marinade was quick to prepare in advance; all I had to do when we started getting hungry was toss everything on the grill and make up a pot of quinoa. Grilling zucchini is also a good way to handle it texture-wise, because it cooks quickly and tends to retain some toothiness rather than turning to mush. I did make several adjustments to the original recipe to use what I had on hand. The marinade called for fresh lime juice, but I ended up using ponzu (the soy-free sort) instead. I’d love to try it again with lime as the ponzu had a pretty delicate flavor against the hoisin. I also omitted the sambal oelek because I can’t handle that level of heat, and used only boneless skinless breasts. Two hours or up to 24 hours in advance (the longer, the better), combine about 1 1/2 cups of the Hoisin-Lime Sauce with the chicken and scallion whites, and toss well; reserve some marinade for the zucchini and garnish. Marinate, refrigerated, turning the chicken at least once. Thirty minutes before cooking, coat the zucchini in marinade separately, and stir to coat well. Prepare a grill and heat to hot, or preheat your broiler; spray a broiler pan with nonstick spray or coat the grill with 1 tablespoon of grapeseed or canola oil. Remove the chicken from the marinade and grill or broil it, turning once, until the juices run clear when the meat is pierced with a fork, 8 to 12 minutes for breasts. About 5 minutes after the chicken has begun to cook, add the zucchini and cook, turning once, until brown, about 8 minutes total. Transfer to a cutting board. Slice the zucchini and chicken breasts on the diagonal and arrange on a serving platter. Drizzle with the remaining Hoisin-Lime Sauce, and garnish with the scallion julienne, if using. Source: Adapted from Simply Ming: Easy Techniques for East-Meets-West Meals , by Ming Tsai.